At the IAA, I came across a sign with a crossed out inscription Diesel. It was a reflection of the entire exhibition: traditional techniques with internal combustion engines on the stands less. This is especially felt in the segment of passenger transport — even in Moscow I recently rode the buses. And at the exhibition they are just “sparks in the eyes”. Sunk an electric wave and to the European manufacturers. 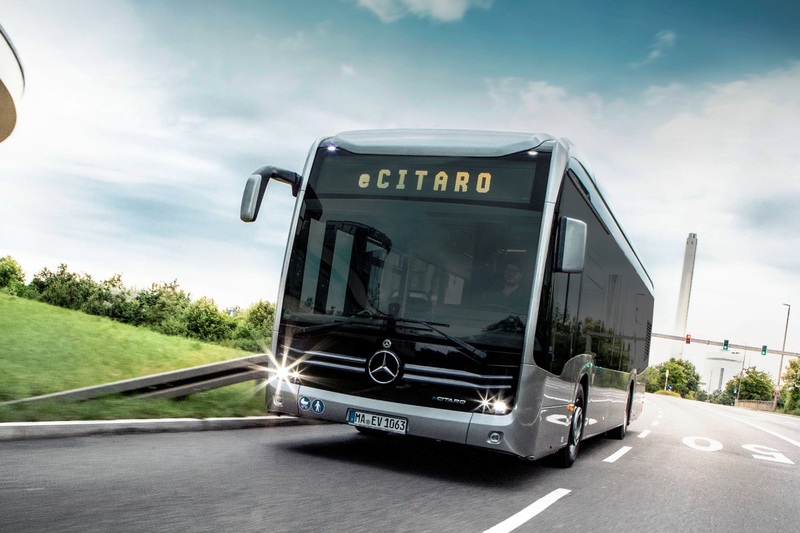 The same Mercedes introduced its eCitaro (more about him in the next episodes of “Trucks and buses”) and has agreed to supply these machines in Berlin. And by 2020 should be tightened and MAN. While he showed a prototype of a city bus Lion’s City E. OK the bus is different from the similar design of the bus, the extra seats in the cabin installed in place of the missing motor box, and a huge claimed power reserve. It is reported that with the engine capacity of 270 kW electric MAN will be able to travel up to 270 miles on a single charge thanks to the battery with a capacity of 480 kWh. moreover, it is assumed and articulated option, batteries which will have an energy consumption of 640 kWh. But if with such characteristics appearance Mana in General standard, the buses on the IVECO stand that spaceships from a science fiction movie. Particularly impressive is the 18-metre blue “accordion” Crealis — and not only the appearance but also the technical stuffing. If you bypass the bus back and raise the head, you can see the folded horns — Yes the same electric bus with dynamic recharging of the trolleybus contact network, as Trolza, which we experienced in St. Petersburg. This giant is designed for high-speed bus systems (like the Brazilian BRT). It is equipped with a powerful 250-kilowatt electric motor and a lithium-titanate battery, which can rapidly accumulate a charge. In the end, recharge from wires, you can travel up to 100 km without a network connection. The price of this “bunching” of about 400 thousand euros. Not less spectacular and standing next to the white buses of the French company Heuliez, a member of the same group CNH IVECO Industrial with. The most notable detail in the appearance of the closed flaps of the wheel. The movement of the buses is the electric capacity of 144 kW. Capacity lithium-ion batteries are not reported, but the claimed mileage per charge up to three hundred kilometers. The cost depends on the amount of battery, but is around 350 thousand euros. Their buses are produced in the Czech Republic. On the stand the local brands SOR stood a spectacular electrical apparatus, which, it seems, took one of the routes. The cabin was installed the device for cashless payment of fare, and on the walls hung maps. Built-in elektroporcelany rear axle ZF motors develop a total of 160 kW. The tank is located on the roof of the battery – 225 kWh Charge as possible from the wire and through the contact of the pantograph on the roof. Mileage on a single charge of about 150 km. And here our compatriots: Volgabus company brought its electric bus Sitaram-12E. A similar machine I have examined in detail in the spring, but the bus has a number of technical issues. On the rear axle — elektroporcelany the bridge, with engines of a total capacity of 250 kW. Battery moved to the roof. Their capacity is not reported, but stated that travel on a single charge can be as much as 300 km. among other innovations — the windshield with electric heating and a new dashboard. From the network Volgabus is charged in five hours. But to qualify for appearance on the streets of Moscow, where buses adopted the scheme with rapid charging on-route Volgabas right arm — and he’s not here yet. Not done the exhibition without Chinese manufacturers. BYD brought to the IAA two buses — single and articulated. It is seen that the Chinese have advanced greatly since the last review. Panel body is now all aluminum, both buses look stylish, and are built well. Motors as “bunching”, and a single bus issue 300 kW. The batteries have a capacity of 340 kWh. That should be enough to sochleneniya at least 200 km (300 km for single). As a General trend, the IAA has once again confirmed that the buses will soon cease to be exotic, having risen in one number with other representatives of public transport.